In the 1961–2008 period, the trend of growing absolute maximum and absolute minimum temperature was observed, which points to climate change. The number of hot days has been rising, and the number of cold days has been decreasing. The data on maximum snow cover depth everywhere in lower parts of the country reveals a downward trend. Nevertheless, in certain areas, Slovenia is encountering even greater and more significant deviations from the long-term avarages with regard to precipitation (storms, hail). The indicator shows annual extremes: the minimum and the maximum air temperatures, the number of days with temperatures above and below the selected threshold, and the maximum snow cover depth in six places across Slovenia. Characteristics of heavy precipitation and storms are described in words. In the 1961–2008 period, the trend of growing absolute maximum and absolute minimum temperatures was observed, which points to climate change. The absolute annual minimum temperature has been growing, whereas this trend is less apparent with absolute maximum air temperature. The summer of 2003 stands out for its temperatures; it was exceptional due to its length and heat intensity. During this summer, some record high temperatures were recorded, along with a record number of hot days. No summer recorded in the long-term series of data, which comprises information for more than a century and half in this region, can be compared to the summer of 2003. The number of hot days is rising and the number of cold days is decreasing. However, considerable differences exist among individual years. According to the foreseen development of the global climate, an average summer in the second half of this century will be as hot as the summer of 2003. 2001 was exceptional for its snow cover, which reached record depths in high mountainous regions, while in the lower regions, the same winter was ordinary. The data on the maximum depth of snow cover across the country reveals the downward trend, which is least noticeable in high mountainous regions. There is also a possibility for a warmer climate to trigger more heavy winter snowfalls in high mountainous regions. However, gradual global warming does not mean that we shouldn't expect extremely deep snow cover in the future. This was the case at the end of 2005. Even in the future, we can still anticipate exceptional penetration of cold air, which was confirmed by the minimum temperatures in 2005. In 2006, the beginning of March was marked by unusual snowfall, which caused a lot of problems in traffic and for vegetation. Snow cover was exceptionally deep in the western Julian Alps in the last two months of 2008. Nevertheless, Slovenia is encountering even greater and more significant deviations with regard to precipitation. In light of calculated trends and deviations of the mean of the last period (1991–2007) from the reference period, a homogenous increase in the number of events with precipitation above 20mm in Goričko and Kozjansko was observed. However, the number of these events is decreasing in the Slovenian coastal region, the Alps and in the Dinaric region. Elsewhere in the country, no statistically typical changes have been observed. However, regional differences may be the result of different precipitation regimes. 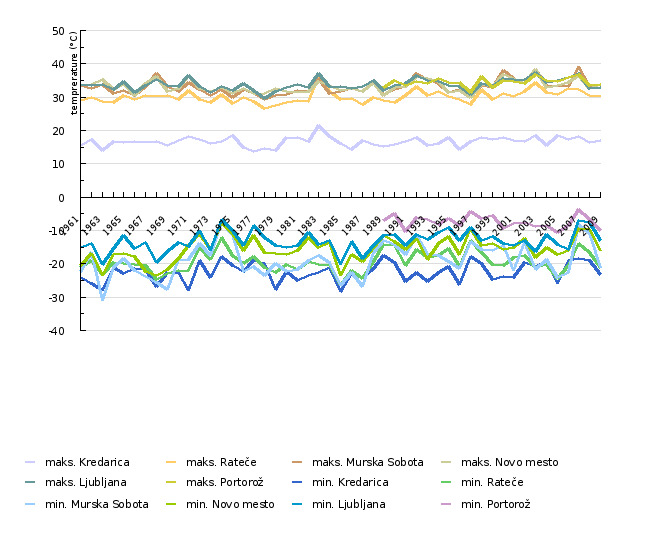 Homogenous growth in the number of days with storms can be observed in Prekmurje, Goričko, Slovenske Konjice, and in Kozjansko, while homogenous regions with a falling number of storms are Dolenjska, Bela krajina and Primorska. Elsewhere in Slovenia, no typical pattern in the changing frequency of storms has been observed, except in the mountainous regions, where an increase has been observed. Nevertheless, even these areas are not homogenous. Homogenous regions with a growing number of hail events have been observed in Goričko, in the Notranjska region in the belt south of Ljubljana, in part of Karavanke, and in a very narrow area on Kozjak Mountain. The frequency of hailstorms is less severe in the southern part of the Julian Alps, in the wider Štajerska and Prekmurje regions, and in Bela krajina and its surroundings. Very intense precipitation lasting from a few hours to a day or two appear locally and can cause landslides and local floods (torrential floods and landslides in Gorenjska and Štarjerska regions were recorded in September 2007). The year 2008 was marked particularly by intense summer storms. In light of expected global climate changes, such events will most likely become more frequent in Slovenia in the future. Objectives summarized by: White Paper - Adapting to climate change: Towards a European framework for action (April 2009) and Green Paper – Adapting to climate change in Europe – options for EU action (June 2007). Source database or source: Meteorological Data Archive, Environmental Agency of the Republic of Slovenia, Estimation of global trends and conditions in Europe taken from the World Meteorological Organisation. Methodology and frequency of data collection for the indicator: The data is presented for the period of 1961-2008. - Advantages and disadvantages of the indicator: The data has been collected in accordance with the recommendations of the World Meteorological Organisation. - Relevance, accuracy, robustness, uncertainty: The accuracy of measurements and the quality of data comply with the recommendations of the World Meteorological Organisation. Kredarica is representative of the conditions in mountainous regions, and Rateče is a measuring station where the conditions in the area surrounding the measuring point have remained unchanged for decades; therefore, this measuring station is representative of valley areas in northern Slovenia. Murska Sobota describes the climate situation in the flatlands stretching across the northeastern part of Slovenia, where the continental climate conditions are most evident in the entire country. Novo mesto is a typical representative of the climate conditions prevailing in the Dolenjska region. The penultimate line in the Table shows data for Ljubljana. The area surrounding the measuring point in Ljubljana has undergone significant changes during recent decades; the data is nevertheless representative for the climate conditions in the city that is both the capital and the largest city in Slovenia. Yet, it should be emphasised that this data is suitable neither for the illustration of changes in the climate conditions within a wider area nor for the assessment of changes arising directly from global climate changes. The last line shows data collected from the airport based in the Slovenian Primorje; it only contains data for the period during which the measurements have been conducted at the current location.